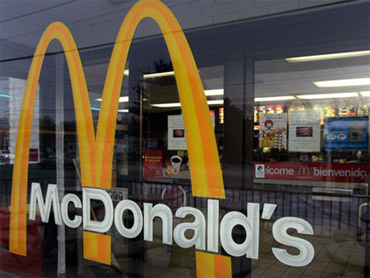 (AP) NEW YORK - McDonald's Corp. (MCD) says strength in the U.S. and Europe drove up a key revenue figure in May, but warned that economic volatility around the world and rising expenses are pressuring its second-quarter results. The fast-food chain, based in Oak Brook, Ill., also said that foreign currency translations are now expected to hurt second-quarter earnings by 7 cents to 9 cents per share. Shares of McDonald's were down $1.15, or 1.3 percent, at $87.23 in midday trading. For May, the company says global sales at stores open at least 13 months rose 3.3 percent. That is a key metric because it excludes the volatility from newly opened or closed stores. The figure was dragged down by results in the region encompassing Asia Pacific, the Middle East and Africa, where McDonald's said sales fell 1.7 percent from a year ago. The negative performance in China was likely the result of new "value dinner" promotions that drove down average checks per visit, R.W. Baird analyst David Tarantino said in a note to investors. He also noted that McDonald's is facing increasing competition in the region, where many other fast-food companies are looking to expand as well. McDonald's noted that it's working to improve results in the region with locally relevant menu options and "convenience enhancements," such as delivery in some Asian markets. The drop in the region was offset by a 4.4 percent jump in the U.S., where demand for the new blueberry banana walnut oatmeal and Cherry Berry Chiller boosted sales. In Europe, the sales figure rose 2.9 percent driven by gains in the United Kingdom, Russia and France, with the company's ongoing restaurant renovations helping improve sales. A mix of premium and value options also helped boost results in the region, the company said. With more than 33,000 stores in 119 countries, McDonald's is the world's biggest hamburger chain and is often seen as a bellwether for the industry. Although it has consistently outperformed its rivals, McDonald's is facing the same pressures from the global economy and rising ingredient costs that are squeezing the entire industry. In a note to investors, Bernstein analyst Sara Senatore said McDonald's faces increasing competition in markets including the U.S., Germany, Japan and China, and that the results in May suggest a slower pace of growth ahead after a long period of exceeding expectations. For the year-to-date, McDonald's sales at stores open at least 13 months is up 5.6 percent, which includes a 6.8 percent jump in the U.S., a 4.2 percent jump in Europe and 3.1 percent increase in the region encompassing Asia Pacific, Middle East and Africa.